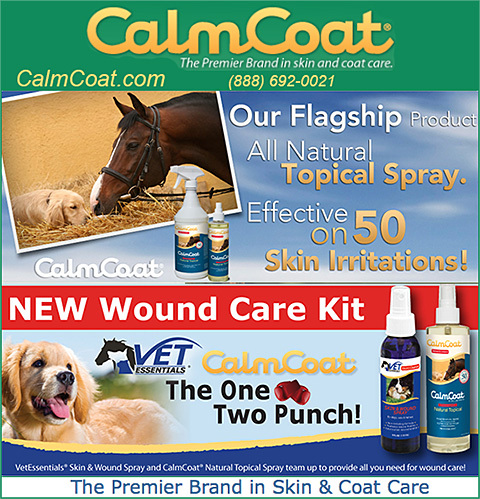 Calm Coat VetEssentials Skin & Wound Spray is an affordable alternative to Vetericyn. VetEssentials is a new line of animal health products that are formulated by a veterinarian. Our mission is to bring you products that will enhance the lives of dogs, cats and horses. We are led by a Veterinarian that has worked with animals of all shapes and sizes for over 25 years. Dr. B is committed to developing quality products that are essential for your pet to lead a happy, healthy life. VetEssentials Skin & Wound Spray is a breakthrough in the cleansing and debridement of irritated skin and wounds on your pet. Classified as a “medical device” that physically cleans the skin and wounds prior to treatment and/or repair. VetEssentials Skin & Wound Spray effectively removes debris and dead tissue from wounds, scratches, punctures, abrasions and skin irritations (with or without infection) including hot spots, insect bites and burns. How Do I Use VetEssentials Skin & Wound Spray? Remove excess hair from the affected area. Hold bottle 4”–6” from area and apply liberally 2–3 times daily or as directed by your Veterinarian. If dressing is required, apply Vet Essentials Skin and Wound Spray liberally to dressing. Apply dressing to affected area. Repeat up to 3 times per day. VetEssentials Ear Cleanser & Deodorizer- This product is an antiseptic, cleansing formulation with aloe for natural soothing benefits and odor control. It is used for routine cleansing to keep your pet’s ear clean and healthy. VetEssentials BodySpray- VetEssentials Body Spray will keep your pet smelling fresh. Beautifully scented with a Japanese Cherry Blossom fragrance. VetEssentials Ultra Soothe Shampoo- This shampoo contains oat protein, aloe and emollients to restore natural moisture to the skin in a pleasing hypoallergenic formulation. VetEssentials Skin & Wound Spray is a breakthrough in the cleansing and debridement of irritated skin and wounds on your pet. To order your VetEssentials products you can visit JeffersPet, HealthyPets, LambertVet, Amazon and locally wherever quality pet products are sold!